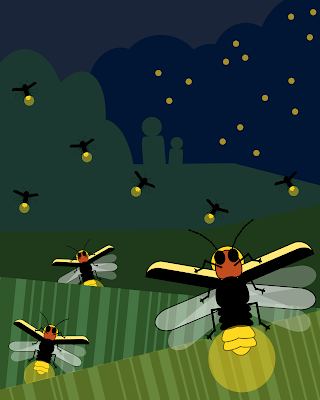 Firefly, lightning bug and glow-worm are three names that all refer to the same thing, sort of. They are all commonly used names for a group of bioluminescent beetles in the the family Lampyridae. Bioluminescence is the ability of some animals to create light from compounds produced within their bodies. More specifically, firefly and lightning bug refer to the adult beetles while glow-worm refers to the larva. Firefly and lightening bug refer to the adult stage of lampyrids, but they are actually not flies or bugs, they are beetles. And the use of the words fire and lightning is a bit ironic since the light that lampyrids create is "cold". All of the energy used (in the form of ATP) produces light with none lost as heat, a feat we have been unable to achieve with light bulbs so far. The name glow-worm refers to the larval stage. Of course they aren't actually worms at all, and to my eye are one of the least worm-like larva I've seen, instead resembling some sort of miniaturized ankylosaur. But hey, it should really come as no surprise that commonly applied names don't stand up to taxonomic scrutiny, and something more descriptive like cold light beetle doesn't have the same ring. There are about 170 species of fireflies in North America. Minnesota has about a dozen species; there's no comprehensive list that I could find, and though fireflies as a group are easy to recognize, identification to species isn't always easy. The larva are usually predaceous and are found in damp environs, often rotting wood. 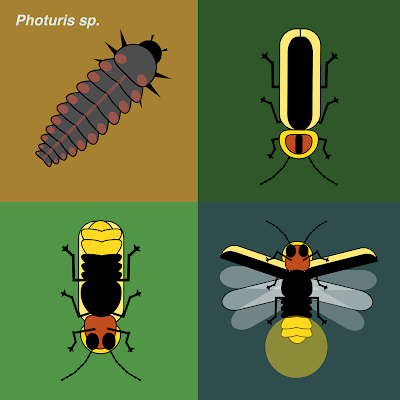 Adults use their light producing abilities to attract mates, with different species often having different flash patterns. Adults are thought not to eat. Some overwinter as adults, possibly emerging when maple sap starts to flow. Some firefly species are active during the day and don't have bioluminescence. 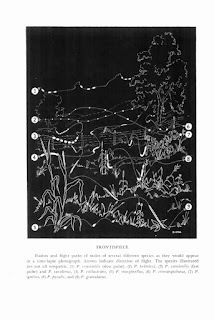 The adults of some firefly species are predaceous and mimic the flash patterns of other species in order to lure them in. There's more to know and other interesting adaptations (like reflex bleeding) that I could write about, but I think I'll refer you to some excellent online resources.